On November 16th 2017, ARIES was presented to the Council of the EU. A delegation of the project represented by Mr. Alberto Crespo from Atos and Mr. Antonio Skarmeta from the University of Murcia, participated in the Working Party meeting on Frontiers / False Documents with focus on "Registration of Identity" . The project was invited by the Estonian Presidency of the Council and the audience consisted of a wide representation of member states experts in identity management. The purpose was to raise awareness on recent research advances, including innovative e-Identity solutions carried out under the scope of the EU Framework Programme for Research and Innovation H2020. ARIES builds on synergies with other on-going research efforts and aims to raise the security of citizens’ online interactions, helping to reduce identity-related crimes and their serious consequences. It is well aligned with some strategic objectives of EU Security Union /European Agenda on Security and specifically with key action points in the European Action Plan to strengthen response to travel document fraud. Mr. Crespo introduced ARIES approach for strengthening the link between physical and digital (paper-less) identities by using high assurance elements including biometric enrolment, verification and appropriate checks to ensure authenticity and integrity of official personal source documents. 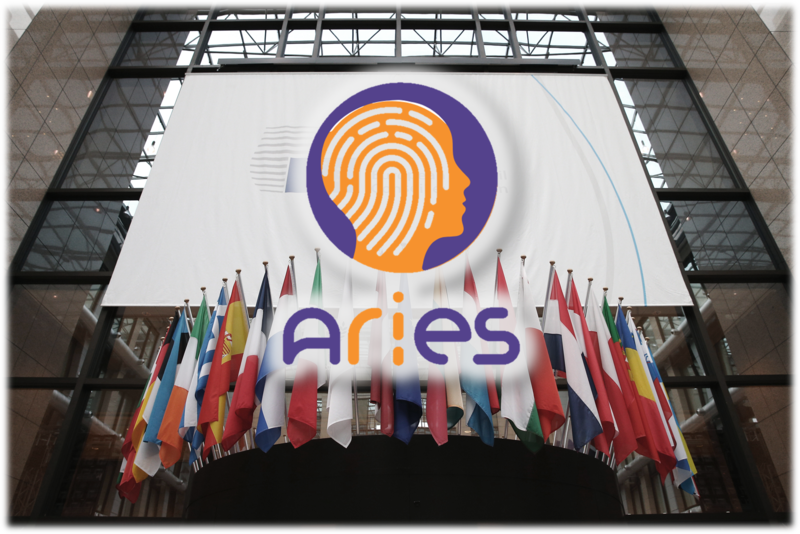 The ARIES project advocates a flexible and trustworthy identity ecosystem, promoting interoperability with major pan-European initiatives on mutual recognition of electronic identity in the frame of the eIDAS Regulation. Mr. Skarmeta presented in more detail the technical features of the proposed open and extensible ARIES architecture which supports the whole lifecycle of secure mobile virtual identity management from derivation from official source documents to its privacy-preserving use for identification and authentication to online services, without forgetting its secure storage. Finally, the two project demonstrator scenarios, with high societal and economic impact and the direct implication of specialized end-users were presented: e-Commerce for secure online shopping and airports security (including travelers efficient and secure authentication at boarding gates and recovery of emergency identity in case of identity loss with assistance from law enforcement authorities). The presentation received favourable interest and comments from a number of participants. During the meeting the project was disseminated directly to numerous member states representatives and identity experts from international agencies and organizations (OSCE, ICAO, Europol among others) with a prominent role in the domain of securing travel and identity documents and related identity management processes.